Do you want to enjoy complete hands-free experience for home entertainment while learning recipe on your tablet in the kitchen for family? Do you want to see the real-time weather info or reminder/to do list from your iPad mounted on the door before you rush out in the morning? Do you want your presentation to be more engaging at showroom, office or conference with the assistance of a large tablet mounted on your metal board with important financial information displayed? Do you want to have a helping hand from your iPad mounted on whiteboard while teaching students in classroom for complex math problems you prepared the night before? Do you want to read the repair instructions or online tutorial on your iPad hands-free while fixing your car? 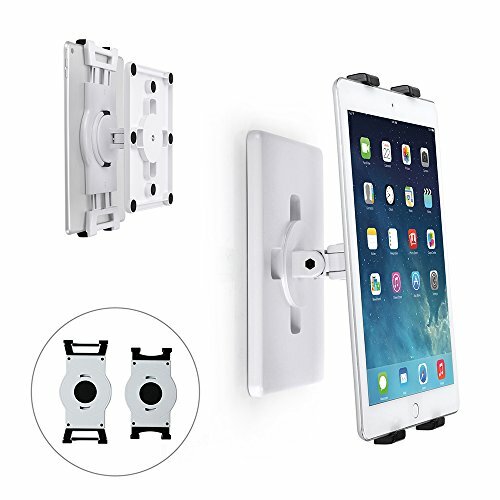 This tablet mount can serve you all the needs of using a tablet at home office and business shops environment. Nowadays, tech gadgets especially tablets have become essential in our daily life. We work, play, watch, read, type and shop all on our phones and tablets. These interactions with your tech gadgets will be much enhanced and facilitated with this universal tablet mount stand holder. 1. Magnet in this product only attaches to magnetic metals surface including iron, steel, nickel. It does not work with non-magnetic metals such as brass, copper, gold or silver.